AFC quarterback Peyton Manning was intercepted 3 times in the first half. The start of the game was interrupted by a surprise rainstorm that lasted through the first quarter, although it ended midway through the second. Both teams' first possessions were punted away, and each of their second drives ended in interceptions; the Chicago Bears' Nathan Vasher intercepted Peyton Manning, then John Lynch picked off Matt Hasselbeck. The AFC scored first on their next drive, culminating with a 16-yard touchdown pass from Manning to Chris Chambers. After the teams traded punts, Michael Vick took over for the NFC in the second quarter, and led the team to the AFC 15-yard line, where Neil Rackers kicked a 32-yarder to make it 7–3. Manning led the AFC right back down the field, and Shayne Graham's 31-yard field goal increased the AFC's lead. Jeremiah Trotter tackles LaDainian Tomlinson during the game. On the NFC's next drive, Champ Bailey intercepted Vick for the AFC's second turnover (both interceptions came off passes intended for Steve Smith). However, the NFC's defense responded with another interception; this time, Darren Sharper returned the interception 35 yards to the AFC's 32-yard line. The NFC was forced to punt it away on their next drive, however there was some controversy on the return. Jerome Mathis was set to receive the punt deep in the AFC's zone, and when the kick from Josh Bidwell came near him, he opted not to touch it. However, it glanced off his leg and rolled into the end zone, where the NFC recovered it, seemingly for a touchdown. However, the officials did not see the ball hit Mathis, and since there is no instant replay in a Pro Bowl game, NFC coach John Fox could not challenge the call. The AFC took over on their own 20, but soon afterward the NFC defense came up with another interception. Roy Williams intercepted a Manning pass and returned it 11 yards before handing it off to the Atlanta Falcons' DeAngelo Hall, who took it 57 yards to the AFC's 20. Michael Vick hit tight end Alge Crumpler with a 14-yard touchdown pass with 8 seconds left in the half to tie the score at 10–10. NFC quarterback Michael Vick scrambles past Dwight Freeney. Jake Delhomme of the Carolina Panthers took over at quarterback at the start of the third quarter, and hit Steve Smith, with three straight passes. The Carolina Panthers provided the NFC's team with their coaching staff, and with the Panthers' quarterback and wide receiver running the offense, the NFC moved quickly down the field. The drive stalled at midfield, and the NFC punted it away. After the AFC's drive, led by Chiefs' quarterback Trent Green, ended in a punt, Delhomme once again moved the NFC downfield before being sacked by Casey Hampton, forcing a fumble that was recovered by the AFC's Marcus Stroud. The NFC's defense once again responded, and on the third play of the drive, Derrick Brooks returned an interception 59 yards for a touchdown that gave the NFC the lead at 17–10. After the AFC punted away their next drive, Santana Moss fumbled the ball away in AFC territory. Green led the AFC down the field again, thanks in large part to a 20-yard run by his Chiefs teammate, Larry Johnson. Green tied the game at 17–17 with a one-yard quarterback sneak. Matt Hasselbeck took over for the NFC again, and led the team on a scoring drive, ending with a 22-yard field goal by Rackers that gave the NFC the lead again. Steve McNair came in for a play at AFC quarterback, and promptly fumbled the ball away. After the NFC punted the ball away, McNair came back and lost another fumble, giving the NFC the ball on their own 18-yard line. Following the fumble, the AFC switched to a shotgun formation. After another Rackers field goal, the AFC took over on their own 26 with 1:10 left. McNair brought the AFC to midfield, but could not get them the touchdown they needed, and the game ended on a sack by the New York Giants' Michael Strahan. Brooks was given the Most Valuable Player award. On December 19, 2005, the NFL announced that fans had cast more than 70.5 million votes via the Internet and the Sprint wireless telephone service, bettering by more than 16% the 61 million votes cast for the 2005 Pro Bowl. Of the top ten vote-getters, all were offensive players and seven, including four of the top five, hailed from the AFC. Colts quarterback Peyton Manning led all players, garnering 1,184,142 votes, a new single-player record, and narrowly edging out Seahawks running back Shaun Alexander (1,110,575 votes) and Chargers running back LaDainian Tomlinson (1,044,360 votes). On the defensive side, AFC players filled six of the top ten spots, though Bears middle linebacker Brian Urlacher led all defenders, earning 420,983 votes; Broncos cornerback Champ Bailey (379,477 votes), Colts defensive end Dwight Freeney (374,289 votes), and Bengals cornerback Deltha O'Neal (373,918 votes) paced the AFC. Among NFL rookies, Buccaneers running back Carnell Williams was the leading vote-getter, receiving 219,736 votes to surpass Steelers tight end Heath Miller (217,928 votes). Cowboys outside linebacker DeMarcus Ware (104,592 votes), Vikings punter Chris Kluwe (100,555 votes), and Bengals inside linebacker Odell Thurman (88,715 votes) rounded out the top five. Notably, four players—Cooley, Williams, Hall, and Robert Mathis—finished first in the balloting for their respective positions among fans but failed to secure a starting or reserve spot for the game. JoJo performed the national anthem. Musical group Backstreet Boys performed during halftime alongside "200 hula dancers, drummers and fire knife dancers and 400 youth performers." Most players selected from one team was seven, tied between the AFC's Indianapolis Colts and NFC's Seattle Seahawks (a Super Bowl XL contender). Of interesting note, all four special team players (punter, kicker, kick returner, and special-team player) for both conferences were first-time selections. ^ a b "2005 NFL Pro Bowlers". pro-football-reference.com. Retrieved January 5, 2019. "Defense leads NFC to 23–17 Pro Bowl win". NFL.com wire reports. 2006-02-12. Retrieved 2007-12-29. "NFL Gamebook – 2006 Pro Bowl" (PDF). NFL.com. 2006-02-12. Retrieved 2007-12-29. 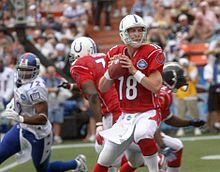 Wikimedia Commons has media related to 2006 Pro Bowl.